St. Martin’s Press, New York, 2006. 275 pages. Available at Sembach Library (MCN F COH). Here’s yet another derivative of a Jane Austen story. 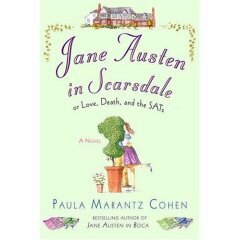 Jane Austen in Scarsdale loosely follows the plot of Jane Austen’s Persuasion, one of my favorites. Anne, fortunately, has a sense of humor about all this. She honestly wants to help the students find the schools that are best for them, not necessarily best for their parents. A new kid is starting his senior year at Fenimore. He’s grown up abroad with his mother and his uncle—who happens to be Ben Cutler, the man Anne was in love with thirteen years before. Her beloved grandmother didn’t think he had the right background or enough ambition. He seemed to be content to work as a clerk in a travel agency the rest of his life. Now, however, Ben is back. He’s the rich and famous author of Cutler’s Travel Guides. Anne remembers him all too well—and that she’s never met another man to compare with him. She tries to adjust to the fact that he comes back with a fiancé in tow. Those who have read Jane Austen’s Persuasion will pretty much know what’s going to happen. They will love it that, where the original book had a young lady have an accident in the city of Lyme Regis, this book has a young lady come down with Lyme disease. However, even if you haven’t read that story, this book is a delightful romantic comedy. Of course with my son a graduating senior, I loved all the humor about getting college applications ready. Anne Ehrlich, like Anne Elliott, is a sensible, practical person with a love that doesn’t die easily. Believe it or not, it’s been a long time since a book kept me up reading until the early hours of the morning, but this one sure did.